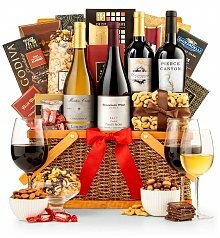 Gourmet fare meets its match - sweet and savory delights perfectly paired with noteworthy wine and artfully arranged in keepsake baskets. At GiftTree, we believe a thoughtfully-selected bottle of wine is the perfect way to express appreciation and consideration for those closest to you. It suggests sophistication and finesse, providing your recipient with a gift that is both tasteful and practical. 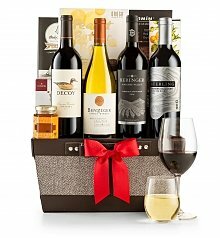 Each of our carefully-crafted and high-quality wine gift baskets is developed with an experience in mind. 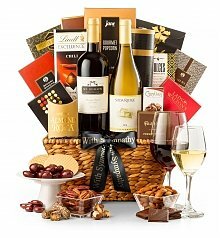 Whether it’s a refined wine bottle basket for the corporate co-worker in your life, or a festive basket filled with delectable gourmet treats that’s ideal for a family member who is hosting a special get-together, we have just the right option for you. Additionally, we stock a wide range of fine wines, from some of the leading brands in the world, including Dom Perignon, Opus One, Silver Oak, Veuve Clicquot and more. 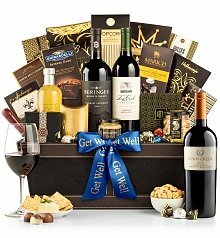 But the allure of our wine gift baskets doesn’t end there. 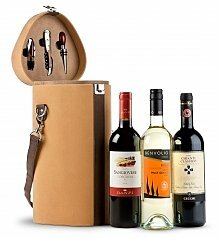 We also have a wide spectrum of wine accessories that you can incorporate into your gift-giving experience. From our Riedel Crystal Boa Decanter to our Stainless Engraved Wine Tool Set to our Fine Leather Wine Tote, we keep our catalog stocked with items that flawlessly complement our wine baskets - all for your benefit. 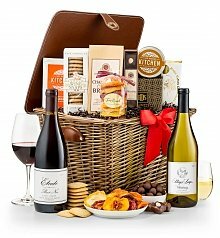 We pride ourselves on being the premier destination for ordering wine gifts online and part of upholding our reputation for quality and value is ensuring that every gift-giving experience is unforgettable.